Jordan Schwartz (Sir Nadroj) built what he thinks is one of the most disgusting scenes in all the Indiana Jones movies that has the ground crawling in giant ants. Although I haven’t seen the movie yet, Jordan’s scene looks very promising. Awesome! 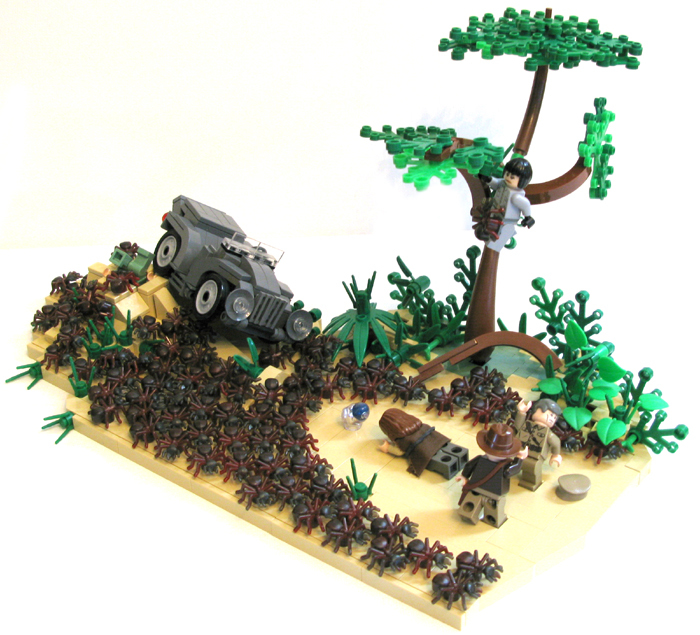 I had no idea LEGO was making ants now (then again, they are rather new). Although I haven’t seen the movie (and probably won’t), this looks really well done to me. Anyway, this is an awesome representation of a fantastic scene! Those scenes are SOOOOOOOOOOOOOO cool! I think the heart ripping scene qualifies as most squirm-inducing. The ants were a definate highlight though! Nice work! …heart ripping as in “Temple of Doom.” Didn’t want to make is sound like there was a similar scene in I4. Nah, Dovchenko’s death beats the heart hands-down. However the movie is not as great as previous Indiana Jones (I think there is some “Indiana Jones spirit” missing), this work is good ! It’s exactly like the movie! Great Dio!